Celebrities hunt for antiques across the UK. Fashion guru Gok Wan and much-loved actress Harriet Thorpe take the antiques world by storm as they shop around Sussex. Browse content similar to Gok Wan and Harriet Thorpe. Check below for episodes and series from the same categories and more! -Get your legs going, girls. -I've got my antiques head on. with a couple of showbiz best pals. It's actress Harriet Thorpe and fashion guru Gok Wan. -Your driving's the scariest thing. Hey, listen, you don't have to drive around Selfridges. That's what I'm used to, all right? -I thought we might run something on the credit crunch. -Yeah, and you shop for a living. -And I shop for a living. Yeah, but you've got a clear advantage. -You were alive when most of them were made. Gok's been a professional shopper and fashion expert for over two decades. when How To Look Good Naked burst onto our screens in 2006. You look gorgeous. Our cameraman's shaking right now. Hoorah! -So, do you think we're getting somewhere? with the lining of this car. But if we do have a crash, it'll take them ten weeks to find you. -I'm just going to look like a head. Lordy! I'm sure they're perfectly safe in the 1980 Corvette Stingray. that we are competing against one another and not working together. -I think that we should take the experts on. -and say, "Actually, we're doing this." but I'm not sure how today's two experts are going to feel about THAT! -I can't believe who we've got today. Oh, I say, you've fashionistaed yourself up for Gok Wan. -Please give him to me! -OK. You need him more than I need him. Ah, I think you two might be in for a little surprise. Once paired up, our teams will kick off with £400 in their pocket. before heading to Southend-on-Sea for the auction. -Ooh, look, we have a white Corvette! -Did someone order a Chinese takeaway? -Oh, my gosh, come back, come back. -Good morning. Are you all right? -No, I'm not. I need a surgeon! -Good morning. Can you get out? -Oh, my gosh, Harriet, lovely to meet you. -So good to meet you. -This is amazing. Are you raring to go? I can't wait to spend the next couple of days with you. -so we've donated her to you, Gok. -Bit of a problem there. -if you two joined forces and you went up against us two. Harriet, I was meant to be with you. -I've been looking forward to this for ages. That means I have to work with him. We've never worked together. We always work against one another. -because we genuinely do believe that we will win this. -Just so you know. We do. Christina, come on, baby! Get in that car. -Are we going to do it? -Let's show them how to do it. but this celebrity duo are certainly confident. Our celebs are heading towards their first shop in Hailsham. So, do these two really have what it takes to take on our experts? -Why are you so confident? -You know me, I like to shop. I've shopped for 21 years as a job, so I'm thinking, "You know what? "Pair of shoes...sideboard - what's the difference really?" -And I love to drive a hard bargain, as you know. and phoning the auction house to find out what's hot in their saleroom. Hi, Trevor. It's Aunty Gok and Uncle Harriet. How are you? -Hi, Aunty Gok and Uncle Harriet. Wonderful. Thank you so much for taking this call. So, what are people looking for currently? Are we going down the knick-knack, bric-a-brac, kind of aisle? -Vintage? Are we doing vintage? -I do all right on both counts. Chinese market is faltering a little bit but it is strong. -But the Japanese market is dead. -You are adorable, you are fabulous. -You put the phone down first. Dooo. -Hi, I'm Gok. Nice to meet you. So, Mick, did you get all that? Anything on that shopping list fit the bill in here? We've got a very unusual item here. -It's only just come in, so you've picked the right moment. -It's Bakelite which is very collectible. -And it's a shaving kit. -Does it have its original blades? -Probably find one or two whiskers in the bottom. -When you say, "Should be", I like that. -I can do that for 40. -I thought you said 30. Do you know how beautiful the colour of your eyes are? -We'll do it for 30, yeah. Cor, this pair don't mess about. First lot bought for £30. And Mick's got something else he thinks might fit their wish list. -It's also just come in. -So this is Japanese, isn't it? It probably would have been blossom if it was Japanese, wouldn't it? Gok's decided to phone a friend. -I'm just so windy today. -I don't need to know that. -Oh, look, Mick's got two more boxes. -I might be able to tell from those. -These are great, aren't they? But that is Japanese. No, that's Chinese, that top one. Let's hope your Japanese friend has a better idea. -Hi, baby girl. Listen, I'm with Harriet. -Basically, we're on an antiques hunt, right. And we've got to try and find some Chinese bits and not Japanese. -I'm putting the phone down. Stay there, stay there! I'm going to show you these boxes. Can you tell us whether they're Chinese or Japanese. Are you ready? Ooh, I don't know. Ooh, gosh. They look quite Chinese. because of their jackets, their shoes. They're wearing traditional Chinese shoes and they're carrying a lotus. -Have they got like Mr T haircuts? -They've got Mr T haircuts. -I love you so much! -You were right, Gok. So, time to talk money. Ticket price is £140 for the three. -I think they'll fly in an auction. -And what's your price, babe? -I couldn't do them less than 80 quid. -You're dancing and I'm working the panpipes. -Can you do 70? Cos 140, that takes us down to 50% off. -You're going to ruin my reputation. -You're going to get a kiss. -Are you going to do 70? -Yeah, thank you very much! -And a kiss seals the deal. Well done, everyone. -Harriet, we're going to win. -What's not to love about this? -Can we have chips yet? bagging two lots in their first shop. Should our experts be worried or is it just a fog to them? -This could really work to our advantage. I don't think they know a huge amount about antiques. it means that we're rubbish. Starting to feel the pressure already, eh? Perhaps nerves will ease once you get going. Let's rock and roll, baby. Ah, are you trying to be Gok? Yeah, I'm just building your confidence. What a gentleman. Although, I'd concentrate on the task in hand. Their first chance to shop is in Eastbourne Antique Centre. Lovely! -It does feel quite weird being in a shop with you. and do our own thing, but we've got to work as a team. -We are the dream team, Christina. We are a partnership. -I'm relying on you to win. -We're working FOR one another here. That's the spirit, guys. Give yourselves the best chance. -Look at this. This is how I feel for you, David. -It's a love heart. Isn't that sweet? I see these quite a lot in the saleroom and look at this - £25. It's no money for a little spinning chair. but they made them by the bucket-load, didn't they? -four million of those chairs. -You're not exaggerating at all. I do love it a bit more with the heart, I must say. Might be a good gift for somebody, wouldn't it, because of the heart. They love it, but can Paul help them out with a good deal? Now, this doesn't belong to me. This is one of my stallholders'. -OK, can you do a deal on their behalf? -I can always do, with him, 20%, so that could be £20. It needs to be half that for us to make any money. That's what I feel. -What do you think, Christina? Would you think 20 quid's too much for that? Well, in order for us to make a profit, I think David's right. We'd love to secure it for the £10 region, if that is at all possible. -Isn't she so lovely? "If that is at all possible". -You have to be nice! -I'll have to call the dealer and ask him. It looks like Christina has found something else. -Is that a collection lot? Bearing in mind this is a job lot of perfume bottles for £60. Do you know, I had 280 of them. I think they've all got silver on them. -and we'll have a quick chat about this? -So, what are you thinking, eh? Auctions, dealers, they're always looking for big job lots. They'll buy this, separate them and sell them for a £10 note each. They need to be 20 quid for the lot. What's the lowest the dealer's willing to go on that chair? -OK, 20 quid and that's it? -That's it, yeah. That one cost him £15. -Do you think it depends on what we can do with these? As we can't be as flexible on this, can we be flexible on THIS? -How about 45 the lot? -Paul, can we buy that job lot for 20 quid? -I'll do it for £25. How about that? -But we need 20 stoppers. -We just need a box of 20. Have we done a deal? Well, they're doing all they can to beat those celebrities. to Muddles Green in Chiddingly, East Sussex. a woman whose life was as extraordinary as her photos. is her only child, Antony Penrose. So, Antony, how did it all start for Lee? and she stepped in front of a truck. except a guy grabbed her and pulled her to safety. because he was Conde Nast, the owner of Vogue magazine. she was on the front cover of Vogue and she wasn't yet 20 years old. -coat to coast, right across America. -Did she become a sort of muse? -and almost instantly, she became his lover and his muse. for some of the greatest pictures of his whole career. mixing with artists like Picasso and Max Ernst. But her relationship with Man Ray was a tempestuous one. -and he just wanted to control her. and went back to New York and started her own studio. when she married a wealthy Egyptian businessman and moved to Cairo. Tell us, how did your mother meet your father? where all her surrealist friends were, and there she met my dad. and he was never the same again. It was love at first sight. -It does exist, it really did it for them! and it was then that Lee reinvented herself as a photojournalist. -accredited to the US army. -She was a combat photographer? and started photographing the siege of Saint Malo. while the Germans slugged it out with the US 83rd Division. Then here she is, a few days later, during the battle. -and photograph herself in a mirror. that just wouldn't quit. And there was always this kind of dichotomy. She knew, so well, how to be a beautiful woman. she could survive an act perfectly appropriately in a man's world. very self-reliant and very able to survive dangerous situations. During the war, Lee took many stark and hard-hitting photographs. photographing the newly liberated Dachau concentration camp. where they discovered Hitler's apartment exactly as he'd left it. Here was this perfect opportunity - hot water, soap, towels, flannel. -And then they realised they had the scoop of the century. which is actually a very famous Nazi image. that was really like saying, "OK, Hitler, you are finished. -"We can do what we like in your house." and the cruelty into Hitler's nice, clean, pristine bathmat. She's not sitting there as a guest. She's a victor. After the war, Lee married Roland Penrose. and went on to give birth to their only child, Antony. she'd hidden away in the attic. with the manuscript of the siege of Saint Malo. Not images, words. I couldn't believe that she had written this material. to assemble it into the Lee Miller archive, which is now what it is. -It's the most profound, moving, amazing story. You see, we discovered a collection of photography. -and that's something that still feels good to this day. some of the most profound moments of the 20th century. Christina and David are making their way to Lewes. -..that maybe my jeans are a bit short. -maybe it's a good idea that he's NOT here. -And do you know what? You've never beaten me on the Celebrity Road Trips. -No, I haven't, have I? -Now's your chance to win. Our experts have arrived at Emporium Antiques Centre. -Would you please get in? With £360 burning a hole in their pockets, what will they find in here? I am in love with Michele. Yeah, to a certain extent. I don't think I'd wish that on anyone. -That's pretty cool, isn't it? That's nice. You've got the George Jones mark on there. but you've got the Art Nouveau thing going on, haven't you? -some things get better with age. -Are you telling me that you're a fine vintage, darling? Michelle, this is what I've got to put up with. -I love that you're so delusional. Michelle, trade on that to Christina and myself, how much would that be? -The very best would be 15. -To be honest, I absolutely love it. If we don't pay £15 for that, I think we're bonkers. -All right, I'm happy with that. -Michele, put that on our account. Right, can you find something interesting? -I found all the last things! -You just gas on all the time. Now, now, you two. You're on the same team, remember. Ah, the shop has a backyard. -Those are nice, aren't they? -Look at all those creepy-crawlies. -Shall I bring the other one out? -Look at all those woodlice! -That adds a bit of age to them, doesn't it? -They just look so prehistoric. -Right, so a pair of those. Late 19th century? Got to be, haven't they? Victorian, cast-iron, really heavy, really good. -Look how crisp that is as well. In reproductions, you just never get anything like that crispness. Nice gadrooned border. Good decoration. -Egg and dart, actually, my darling. -No, gadrooning is very different. -You're sure you couldn't call that gadrooning? I'm a gadrooning specialist, darling. -Listen, I'm going to gadroon you. -Hey, David, listen to her. It is egg and dart. Ticket price is £195 for the pair. Can Michele, ma belle, do them a deal? -What's your absolute def on them, darling? -I think 120's got to be good, hasn't it? We're at 120 for those and 15 for the pot. Could we say 130 for the two? -130 for the pot and the urns? -As it's the end of the day. -Thank you, Michele. I'm sorry about Christina. -Don't worry, I won't come back, I promise! a marvellous end to a busy day of shopping. and preparing for the shopping day ahead with no fog - hopefully. So, what are we going to do then? Cos those two are going to win. -No, they are not going to win. -Mrs Vase and Mr Pots. -I think the only thing we can do is find out what they've bought. -Why don't we steal their car? -And then you should faint. Yeah, pretend you're ill, I'll take you outside for fresh air. -I'm an actress. I can do that. -and find out what they've bought. Hey, will they stoop at nothing to win? leaving a massive £300 available to spend. the majolica planter pot and the pair of garden urns. They have £230 to play with. Our celebrities and experts are starting today in Bexhill-on-Sea. -That looks so horribly tempting. -I didn't move my leg. -Hello, you're both so colourful! -The kimono is a triumph. Let me see. Turn around. Oh, it's great, honestly. And those jeans - great for the rear. Right, enough of the fashion critique. Let's shop and less hand-holding. You're on opposite teams, you two. what can our celebrities find in Eras Of Style? -Right, so what are we looking for? -What about those little funnies? There's something quite nice about that. I like the colours in it. They look rather extraordinary. What the hell are they? Property of District Ky Son in Vietnam. -Asian - let's do it! -No, don't lift it, darling. Your back. -Look, 195. No, it's fine. No, it's not. Ooh, out of the way. It's wooden. I thought it was made of hay! -Do you think we should do both, though? I think one. Who would buy two of these? All right, let's open it up to make sure it's in good nick. -So, it's French. Mon Dieu! -"Le pomme de deux cent vingt..."
-Shall I give this a go with Andy? complete with an interesting collection of documents. Can they get it for less than the £195 ticket price? Stand by, Andy. -I think we probably should start around the 100 mark. -100 is a beautiful number. -That is cut in half. I can't. -Pretty much, pretty much. You can do it. You can do anything in this world. Come on. High five. -I love your hair. Have you been growing that for a while? -George Clooney, in Venice, at the wedding! -What about 120 and we're done? -Phew. Love it! Thank you. We'll have it wrapped. With a bow, if that's all right. Well, now, who said compliments don't get you anywhere? First deal of the day done. What will they unearth next? These are a bit more modern. with a couple of brandy glasses and fill them up. -OK, so here we go. We've got two decanters. Every side. Every side is beautiful. -What can we do? Cos you are incredible. -50 quid. 50 quid for the pair. 35 to 40? I know that's painful. -That gives you a chance then. -Andy, you're the kindest man in the world. -I've never sweated so much in my life! Our celebrities have been getting some generous deals from Andy. But what of their rivals? -Christina, how do you feel about art deco pieces? -Art deco - do you like it? -Oh, I love a bit of deco. Check that out for a desktop art deco piece of kit. That is a good-looking piece, isn't it? -It's a barometer, isn't it? -Yeah, so we've got a little gauge there. -That's a clever bit of kit. Oh, a perpetual calendar. That's good. So we've got Fahrenheit symbol there. -it original or is it a copy? And I think we're absolutely sure that is original, isn't it? -I like it but how much is it? and I'll go and find out. At the beck and call of both teams, Andy's up again. -and that's just to give you a chance. -Andy, look me in the eyes. -Andy, don't look in those eyes! Andy, look in her eyes. -I've just been looking in Gok's eyes. -And we're a happy, happy girl. -She's done it. He's looked into the eyes. That's it. 35. -Andy, look into the eyes. -£30. Look at me, go on. -You're an angel. Thank you. Andy's certainly being kept on his toes today. Meanwhile, it looks like Gok's got his fashionista hat on again. -Oh, my... They are gorgeous! -Oh! Oh, look at that! I mean, what a hat! I'm thinking that's probably '30s, I think. Maybe, actually, a bit earlier than that. Maybe late '20s, '30s. Oh, God, Harriet, you have found... I think we should do this. ..for you and it's, obviously fashion. -But this one, for me. -Shall we get Andy? Shall we find out? -Andy, what do you think? -What are the prices of them? OK, let me just model this for you for a moment. A little lower pour moi? Oui? -I'm putty in your hand. -I think we'll take them for 110. I feel that way. We love that. We should give you some money now. Now, this is a present from me to you. -Harriet, can we have the money, please? I was expecting 50s there, Harriet. may have unearthed a real gem with these 1930s pheasant feather hats. -Hang on, what are they up to? Are they actually nicking the experts' car? That's terrible! -That was all right, wasn't it? -It was good. Well done, you. and are making their way to Hastings. Look at this. We've got a castle. who toured the world collecting both stories and artefacts as she went. they were bitten by the travel bug. To show them round is education officer Catherine Harvey. She had the most amazing eye, the most amazing interest. as she went around collecting on their steam yacht. with people who couldn't afford to do the same. and donating all the money to charity. -and they all went with them. -died from scarlet fever aged four. -On one of the tours? is called the Sunbeam and it's named after her. and the figurehead is a likeness of Constance on the front of the boat. -So she still went with them. -She did, in a way, didn't she? are all recorded in the books that Annie wrote. -She wrote about her journeys, did she? and were soon published by Longmans. the one that described that round-the-world trip in 1876.
and her family because they'd read her books. During a trip to Australia, in 1887, Annie died of malarial fever. She was buried at sea, aged just 47 years old. Annie had been writing at the time, calling it The Last Voyage. in her wonderful journals and amazing collections. And what of our celebrity car thieves? -On the open road towards Sedlescombe. -Gok, can I ask you something? -Do you like this car better? I can't believe we stole this car and we had a much better Courgette. -Can I make a suggestion? -We steal the other one right back. I think we have to. We want the roof off and do you know what? -None of their stuff's IN the car! -and none of it's in here! our celebrity team have just £30 left to spend. and dealer Paul have something on their wish list? We're looking for something British and silver, if possible. -And something which is beautiful ornate, decorative. -Eye-catching. Something that's going to give us the wow factor. -Not asking for much then, are you?! -That's a very nice little vesta box, but it's £68. -We've got 30. We've got no more. it was a box that you put matches in? -You see the striker on the bottom? -And was it sailors that had them? They had it on their chain. Cos everyone smoked, back in those days, didn't they? -And they all had them. -it feels so beautifully historic. -Do you think that would be good? -I think it would be good. -are the initials of someone. because it was so personal to someone? I don't think so, because it's so old. -And it's a quality piece. But will the owner do a deal for 30? -So, where are we then, Paul? -and I'm going to charge you £30. Thank you so much. You adorable man! Money, you're going to have to pay. Now, would you like this wrapped or how would you like it? -I'll do it like this, babe. Thank you. See you later. Bye. Love you. And just like that, Harriet and Gok have spent every single penny. But have our novices bought well? Time for the experts to get an eyeful. -Who wants to go first? -Harriet Thorpe, show us your wares. -I think you should reveal. Reveal, Harriet. -I love the hats! I LOVE the hats! We knew you'd go theatrical, we knew it. -And I love, my gosh, the carrier. -Whatever it is - is it straw? -We have to open it. -It's got original paperwork in there. -Which is travel... So, it's basically dated. It was obviously done by somebody who travelled. -It is 1921, this one. so it's a great aesthetic piece. -and I think that is actually quite desirable. You actually have bought with passion, haven't you? You bought the things that you really love. And that's part of the enjoyment, with this business. -If you're going to shop, you've got to shop! -I'm really, really interested. You've spent every pound? -Good for you! Now for the experts' lots. -Oh, they're beautiful. Look at those. cos there's loads of them out there? Have you nicked them? -Did you see the two patches on the lawn? -That's where WE were sitting! I have to say, I love the urns. They're incredible. and I would use them in my own home as well. I think they're beautiful and I love the proportions, I love the size. -Do you like the big pot? -I love her. She's got a chip though. -I do like it. Is it a potty? -It might turn into a potty. -It's a planter. It's a jardiniere. But it's by somebody called George Jones. -So it's got a name on it? George Jones was a very famous maker of majolica. Weren't these the last hats that Coco Chanel ever made? -They're the hats that made her have a bobbed haircut. -but they haven't, have they? -I feel really proud of that, don't you? Honestly? -Well done. We'll see you at the auction. So, out of earshot, what did they REALLY think? -You look a bit deep in thought, Mrs.
-I AM deep in thought. I love that they bought everything with absolute passion. -but I'm really worried about those hats. -£50 or £500 - you can't value the hats. -a barometer on your desk - who's going to use that? and he just loved it. -Apparently, we are bang on trend. -You know what else is happening? -We're taking back that Corvette. and have now motored their way to Southend-on-Sea for the big finale. -and not that rickety thing. -That was hideous. Why did they want that? -Well... You know, suits their buys. -I think we've got a good fighting chance. -the next time they're out buying some antiques. -Do you think we're going to win? Here they are. Wahey! They look cool. -Oh, we got the clothes right, Gok. -We got the clothes right. We got it! -I'll open the door over this side. and the man with the gavel is Trevor Cornforth. My favourite item today is definitely the hats. and if they don't do well, I'd be extremely surprised. that's the box of perfume bottles and the planter. people simply do not want to buy damaged goods. but if it's damaged, there's no point. They spent a total of £200 on five auction lots. Our celebrities' clever buys could stand them in good stead here. They shopped boldly, spending the full £400 on six lots. Right, it's the moment of truth. which has buyers online and in the room. -Have you been to an auction before? First up, it's our experts' biggest spend - the cast-iron garden urns. Start me at £50, get them going. Any interest at £50 on the garden urns? -You've got one, you've got one. -We need a long way to go yet. -60 on the net. 70, sir? -No, against you then at 60 on the net. -We're at £60 at the moment. Surely more than that. Any interest beyond £60? This is a pair you're buying. At £60. -Nobody with a garden? 70 with the gentleman. -You got another one, same guy. I need 80 on the internet. We're at £70 at the moment. Fear not! There's plenty more to come. We should be used to it. Even though we are your competition, I do feel really sorry for you. -Don't you feel bad for them? -Can you feel the sincerity? Yeah, that's how bad we feel right now. -No flies on me, baby. Let's see how the experts' spinning chair fares. I love this. I've found my new hobby. -£20 to get it going. Any interest at £20? 20 I'm bid. -It's on the net at the moment at £20. I've got £20 at the moment. Where's 25 on this one? 25 in the room. Gentleman's bid there at £25. I need 30 on it. At £25 in the room and I need 30 on this one. -Go on! Who hasn't got a spinning chair? -Put your hands up. No! Hurrah, a profit. That's more like it. -spending the money on them, you want them to do well. I've got over those products. -How can you say that? -She's so bad. So bad. It's time for Harriet and Gok's first lot - the silver vesta case. Let's get the bidding going, shall we, at £20. Any interest at £20 on the little silver vesta? I've got £20 bid at the back of the room. Any advance on £20? 25. -That colour looks great on you! -£30 in the room at the moment. -It's a room bid at the moment at £30. -All done at 30, no? -We love you! Merry Christmas! This is actually harder than getting women naked in a shopping centre. I say! Will their glass decanters prove more popular? Start me at £10. Get them going. I've got 10. 15. 35 in the middle of the room. -35. Oh, you need a bit more. -They're my pair, come on! -I've squeezed as far as I can. -Lost a fiver but, hey, we're still in the game. Someone has bagged a bargain with that pair of decanters. Up next is Christina and David's majolica planter pot. Can this damaged jardiniere pull in a profit? Start me at £20 on it. £20 to start. £20 I'm bid. -I love the fact she was so shocked. -I've got 30 bid here. 35. 40? 35 in the room then. It's on my left at £35. Are we done at £35? -A gentleman of excellent taste. Fantastic profit there for our experts. with your Bakelite gentleman's kit. 20 to start anywhere? Good piece of Bakelite. It's in very good condition. 20 I'm bid in the room. We're at £20. At 25 here. Are you 30, sir? No. At 25 again to you on the front row. All done at 25. The Southend crowd are getting some good deals today. How are you feeling about this auction experience? -It's the best day of my life! if Christina and David's selection of scent bottles do well? Start you at £20, see where we go to. 20 to start. -20 I'm bid, here on my right. 30 in the room. I've got 30 in the room. I need 35. Are we all done at £30? Surely not at £30. -It's in the room at 30. -All done at 30? He's sure he's going to get them, isn't he? At £30. That profit pushes our experts further into the lead. and the auctioneer's favourite lot. Can they help close the gap? Let's start these at £50. £50 to start, surely, on the three hats. -I have a bid of 50. -Any advance on £50? 60. -She hasn't bought them yet. £70 to the gentleman? At £60 with the lady at the moment. £70 to the gentleman with the wonderful smile. -At £60 at the moment. Any advance on 60? -Thank you, you gorgeous man! -You are amazing. You get a kiss. -Well, it's been nice knowing you. -Oh, dear. Here we go. £80 for the lady. 80, sir? Harriet will kiss you. £80. Are we all finished at £80? I hope not because they're worth far more than that. -I can see your fingers twitching. -Are we all done at £80? -I shall fall off the rostrum. £80. Thank you very much. You look beautiful. That lucky lady got herself a fabulous deal there. will do a bit better. Start me at £50 and see where we end up. £50 to start. -I've got a bid of 50 in the room. 60, sir. 70 in the room? 70 in the room? At 70 in the room. Looking for 80 on the net. This is exceptionally cheap at £70. Back in on the internet. We squeezed them at 80. Are you out, sir? I've got £90, seated in the room now. Internet, are you out? I've got £90 bid. Great to see that loss hasn't dampened Harriet and Gok's spirits. Time for Christina and David's final lot. Can they push further into the lead with their art deco barometer? Start me at £20 on it? 20 bid on the front row. Gentleman here at £20. At £30 in the room. At £30 in the room. 35 surely? Are we all done at £30? -No, 35 against you. Are you out? I've got 35 on the internet at the moment. Are we all finished at £35 on this one? -You got a fiver on it. That will actually result in a small loss after auction costs, I'm afraid. let's hope Harriet and Gok's oriental trinket boxes prove popular. -Start me at £20 for the three of them. -We've got 20 here. Go on. That's three boxes you're buying for £20. 25 on the net. -30 in the room. I've got 30 in the room. -We've got to get to 100 and we're there. Any advance on £30? In the room at £30. Can I squeeze you any further? -35 at the back of the room. At 35 at the back of the room. Looking for 40. -All done at 35. Are you done? -They are stunning, let me tell you! -Well, it's more good news for our experts. -That's it. Are you feeling a bit better now? -I'm shattered. Do we get therapy after this? Seriously, we need to be talked down. -I'm going to have to carry you out. I need two weeks in the Himalayas to get over today. -Come on, let's go and do some sums. our celebrity antique novices or our well-versed experts? Harriet and Gok started with £400. After paying auction costs, sadly, they made a loss today of £158.10. So, they end the trip with £241.90. albeit a lot smaller - of £40.10 after auction costs. -We all know... We think we've all lost a bit of money. -So, it's all down to scale of losses. -Not starting well, is it? -you and I lost about £40. 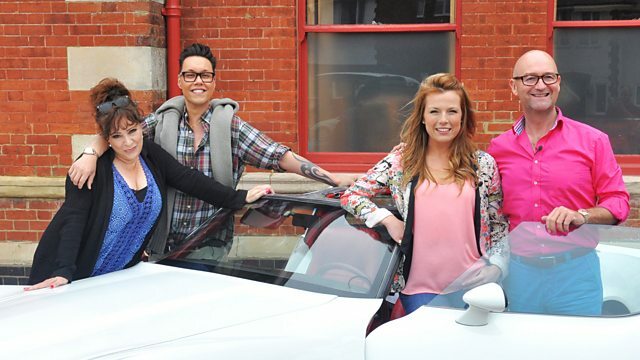 Gok and Harriet... you lost about £160. -Does that mean we won? We're going! Nothing to us! -I can't believe it. I can't believe it. Because we've won? -Don't even look at them! You mean nothing! You and your vases and your broken perfume bottles! -we are taking the car! What a pair of jokers. Ooh, can we have the car back, please? Fashion guru Gok Wan and much-loved actress Harriet Thorpe take the antiques world by storm in this episode of Antiques Road Trip. These confident celebrities give experts Christina Trevanion and David Harper a run for their money as they shop around Sussex and head for a nail-biting auction in Southend-on-Sea.